I am so excited to share with you Interior & Spaces first open house for 2015! Interior & Spaces Home Design is a residential and commercial full service design firm (interior & exterior) established in 2014 by myself and design partner in crime Niki Silverweb. This year Niki’s workload increased and I took over the reigns as CEO and head designer. With strategic marketing and phenomenal exposure due to my Avi Choice nomination, my client list and projects exploded. It’s rare now that Niki & I have the opportunity to work on a sim build together. We would be honored to invite you to our East Meets West Open House from September 1st-4th! Niki designed a striking luxurious Balinese tropical oasis fully submerged within the environment and raised it up on stilts with the sound of crashing waves in the distance. The Trompe Loeil Seaside Cottage is a wooden clapboard one room structure with broad overhangs and open veranda. For the sim build Niki added mature palm trees and rock walls to enclose the space. The veranda welcomes the visitor to a gorgeous home with multiple seating around the fire pit, views of the ocean and mountain region, and umbrella drinks ready at the bar. The one room cabana is divided into three separate areas: living room, dining room and bedroom suite. The interior of this sophisticated, well-appointed home is contemporary with a strong color palette of aqua, orange, lime and kahului in the living room reflecting island living at it’s best with vaulted ceilings and fans. Feast your eyes on all the tempting array of delicious delights presented before you on the buffet bar and dining table. Moving from the main quarters we enter a serene bedroom suite in a neutral palette of white linen and carved wood furnishings. In the bathroom area is a modern deep soaker tub. Potted tropical plants and flowers accessorize the cabana. Niki wanted to highlight Balinese decor with the guiding principles of nature, open areas, light and tropical luxury. On the other side of the beach sim are three shacks all with different themes: Americana, Nautical and 80’s Neon Miami. These beach shacks are typical of California coastal living, small interiors with large porches and back decks. The Americana hut is decked out in Red, White & Blue, ready to celebrate with BBQ, picnic table and a smorgasbord of sweet treats. Or maybe you prefer sipping lemonade and watching the sun set, then the Nautical hut is for you. Complete with a bar, chill zone and tons of spots to relax. Grab your Ray-Bans and acid-washed jeans, head over to the 80’s neon Miami hut for all your Fiesta Forever dreams. This hut was designed with a colorful bedroom, party deck and watermelon themed front porch. I enjoyed creating these three different spaces and there’s something for everyone, so head over and check them out! Happy Sunday! According to the calendar, summer doesn’t end until September 23rd, so there’s plenty of time to enjoy! Grab your overnight bag, sunscreen and passport, we’re headed to Key West, Florida (USA). Key West is the southernmost city in the Continental United States, located 129 miles southwest of Miami, Florida, and 106 miles north-northeast of Havana, Cuba. Cuba, at its closest point, is 94 miles south. Key West is a small seaport city, total area 7.4 square miles and on the dividing line between the Atlantic Ocean and the Gulf of Mexico. It was also a hideaway for authors Ernest Hemingway and Tennessee Williams. Key West is divided into four distinct areas: Old Town, Casa Marina, Mid-Town and New Town. With a tropical climate, similar to the Caribbean islands, the bright-colored historic homes (1886-1912) dotting Old Town called conch are wood-framed one or two-story structures built on foundation piers above the ground, with metal roofs, horizontal wood siding, and covered porches, attributed to immigrants from the Bahamas. Some Key West design elements are bright colors, clean lines and minimal clutter with the focus on bringing the outdoors in as much as possible through the inclusion of large windows with minimal coverage and vibrant color selections that mimic the sand, sun and sea. It’s typical to see white furnishings with pops of bright-colored pillows or throws, louver shutters, natural fabrics, coastal art and accessories such as seashells, sailboats or sailfish in this laid-back tropical seaside oasis. They say you only have one chance to make a first impression. The same applies to your home as it’s a reflection of your personality and style. A great foyer serves a dual purpose, first function and then an inviting space to greet your guest. I styled a ‘under the sea’ themed summer beach house highlighting a few key elements to make a greeting entry including: table/cabinet, mirror, chair, empty baskets for keys, newspaper or mail, baskets of pillows or blankets for the porch, potted plants, lighting, and some fun decorative accessories. One could also add a collection of family photos or coat rack/umbrella stand. Don’t over look the importance of the first impression of your home. Happy first Monday of August! A few days ago Perfect Ten August round kicked off with 10 designers and creators offering new exclusives discounted up to 50% off. Perfect Ten monthly shopping event runs from 1st – 15th every month and hosted on the Cookie Jar sim. Today, I’m featuring Tylar’s Treasures Summer Days Collection including teak lounge with 11 single and 8 couple sits, 30 intimate poses, and dance & lotion animations. There is also a texture change umbrella with teak table and summer beach bag in 7 texture options. The Summer Days collection is sold as a set or separately. In addition, Tylar is offering the Pool Float with 6 texture choices and solo/couple animations, all available at Perfect Ten Shopping Event. I also wanted to mention The Aloha Fair launched on July 27 and is available until August 10th with lots of free summer fun items including my Hawaiian bikini (group gift), dress, sunglasses, jewelry, hair flowers and beach ball pose. Stop by, grab the Aloha gifts and soak up the sun on Tylar’s Treasures beach lounge! In my last post, I gave you a taste of Serenity Style Summer Beach Gacha Collection available at OMG! Oh My Gacha event until July 31. Today, I wanted to featured the whole beach collection which consists of a bag, towel, hammock, boat decor, pouf, and rare beach shack, $80L a pull. Also included in the seaside scene is the Vintage Sea Decor Set available at On9 event until July 28. The Vintage Sea Decor Set includes animated vintage swimmer rings and chalkboard “Sea is Life” decor with paddle and floater rings. To complete the shoreline styling, I used the “Sea Side” wooden decor fence with animated pillows on sale at The Chapter Four event until July 25. Lastly, I’m giving you a sneak peek of Sway’s Summer Drinking Jars on sale for Fifty Linden Friday, out early. Hope you enjoyed my mini coastal staging perfect for summer loving! Hello & welcome to Hidden Gems in Second Life! My name is Gloria Silverstone. 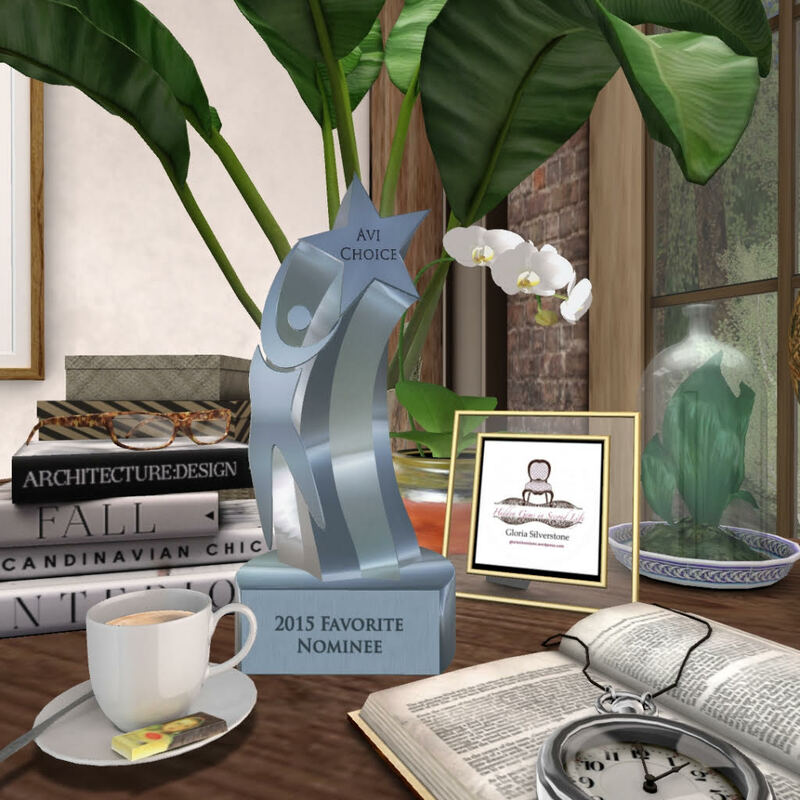 I'm an interior designer and lifestyle blogger on a virtual reality gaming platform called Second Life. SL parallels the real world and is a trend indicator. My career background is in marketing, events, sales and public relations in the Silicon Valley. I utilize SL to hone marketing communications messaging, branding, and business development.